No adhesive necessary. Easy to put it On! Easy to Remove it! Slip the Tag into the E-Z Mount and stick it to the windshield with the suction cups. Suitable for the following States: NJ NY PA DE IL IN OH VA WV MD MA RI NH SC FL and I-Pass C-Pass Palmetto Pass. For use with both the new smaller Kapsch Model 801660A-TAB and the original Mark IV transponder (See back of unit) Please check compatibility. Avoid risking a costly toll violation. 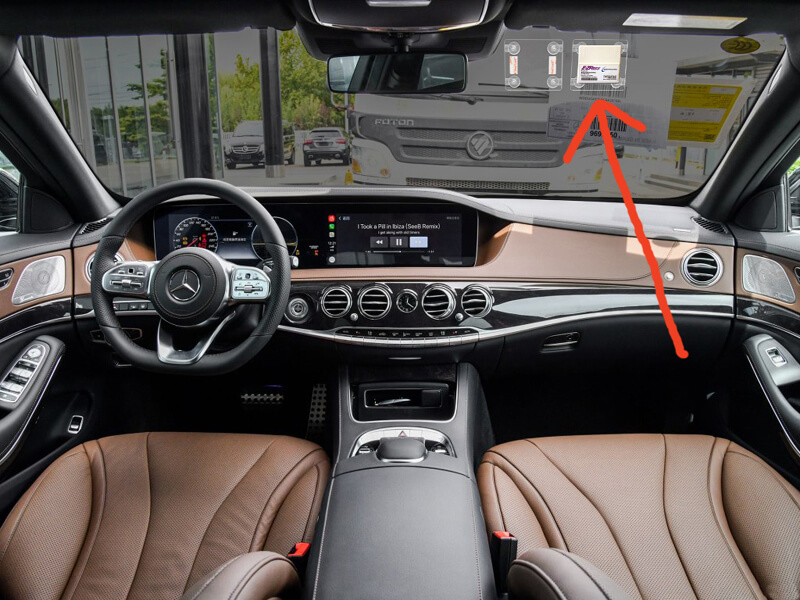 Toll authorities require that toll passes be firmly affixed to your windshield, not hand held. The E-Z Mount Toll Pass Holder allows you to firmly mount your toll transponder to your windshield without the sticky mess of a permanent adhesive. The E-Z Mount Toll Pass Holder attaches to your windshield using dual suction cups making it easy to install, easy to remove and easy to switch between vehicles. The E-Z Mount Toll Pass Holder is Clear and made from lightweight UV resistant ABS plastic and comes with a lifetime guarantee. I bought this because I didn’t want to stick adhesives to my windshield. The problem with this product is that when the temperature changes drastically (very hot in summer or very cold in the winter), it affects the suction cups and the whole thing falls off. Unfortunately my hazard light button was in its path, so one snowy morning I woke up to find that my car wouldn’t start. The EZ Pass holder had fallen off during the night, turned on my hazard lights, and drained the car battery. It happened again that summer, so I finally threw the thing away. I just used the EZ Pass toll tag holder this morning after having installed it last night. It is very basic, but works well enough. I am have a NY EZ Pass so I found the mount to hold the NY EZ pass pretty well (I have the smaller slim ez pass), but there was a small gap and some room for the EZ pass to move around within the mount. I was originally worried that the EZ pass would jiggle and bounce around in the mount, but it didn’t. And the suction cups seem to work perfectly fine and hold the mount and the tag in the windshield. So far, a great product. It definitely fits my old-style EZPass transponder, and it sure beats those Velcro backings that last no time at all. My husband really needed this for his work SUV. Usually it was me having to hold the transponder up to the windshield on long trips up and down 95, plus that’s supposedly naughty to do now, but when EZPass gives you flimsy adhesive, what do they expect? Problem solved, and this was the ticket! Although this toll tag holder is roomy if not bulky, it holds my small 2015 Maryland transponder securely. I have been able to place it in a position that my mirror hides it. While I have read some negative reviews on the holder falling off the car, so far the holder has been secure in moderate and hot weather. Perhaps the reason for my success of its holding securely is that I first cleaned my window with glass cleaner and then affixed the suction cups to the wet surface. We live in Florida and New York. When in Florida our toll pass devices would fall off because the Velcro couldn’t take the heat. We have tried all kinds of Velcro. to keep our Sunpass attached to our windshield but to no avail. I ordered this holder and stuck it on the windshield and it has been theee for weeks, baking in the Glorida sun!! Success! It is also easy to switch out toll devices depending on what state we are in. Thanks!!!! Item is designed to fit both the old transponder and the new transponder, it does that, however, while mounted, the old transponder that I have rattles around in it as it is not quite thick enough to fit snuggly, I don’t believe either fits snuggly. Dual design is not a good thing! First time in a long time I was able to surprise my husband with his christmas present. The EZ Pass we have fell off the window because the adhesive strips no long hold it on. Each time we went through the toll areas, he had to hold it up so it could register on the meter. I decided this would be easier to put on the window (has suction cups) and stay on the window so my husband wouldn’t have to hold it up anymore. .He was thrilled.